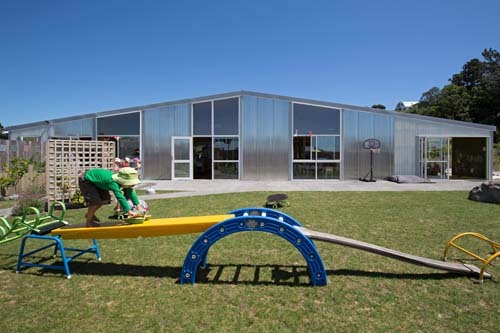 Situated in New Zealand's Taranaki is the recently completed (and NZIA Awarded) Jumpstart Preschool designed by Atelier Workshop. The modest building has been praised by the New Zealand Institute of Architects for its response to the difficult industrial context and a tight budget. 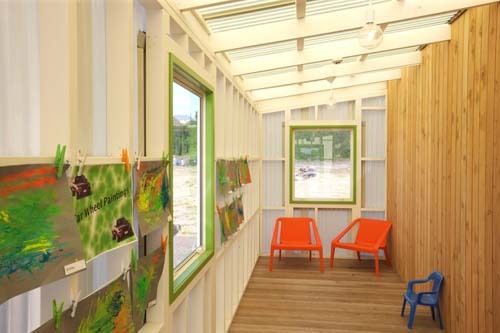 A simple form, aesthetic and use of material is employed in a way that is conducive to the required scale and robust requirements required by early childhood education and care pedagogy. 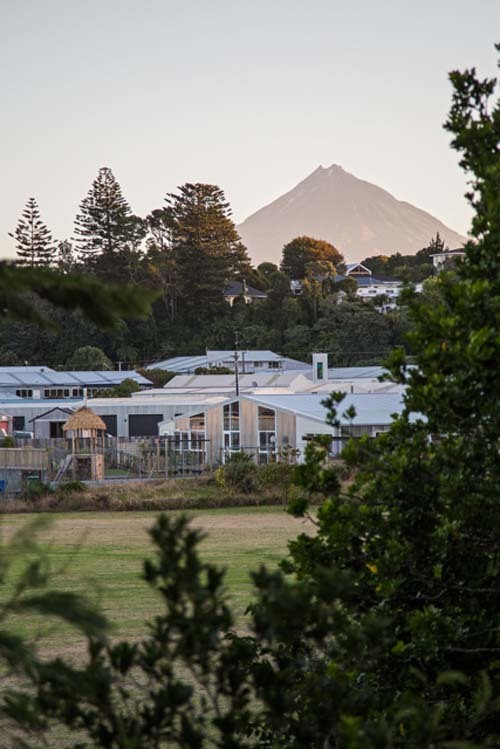 Seen above, Mount Taranaki looms in the distance. 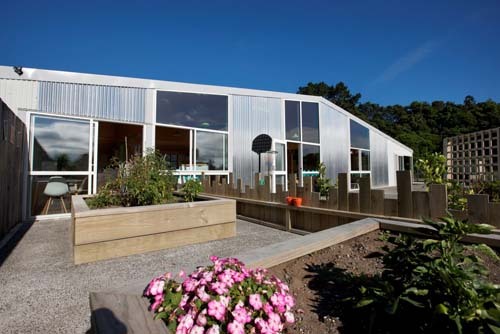 Externally, the simple elongated A-framed building features corrugated metal cladding, semi-transparent polycarbonate sheet sun-screening and floor to ceiling aluminium framed glazed panels and doors leading out to the large outdoor (and mostly natural) play area. 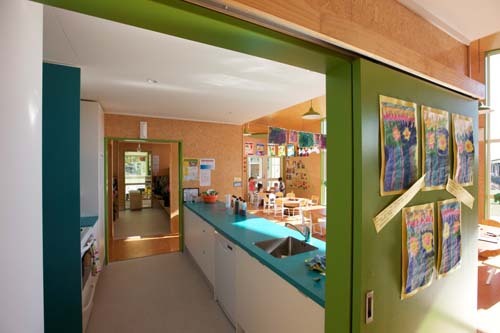 Internally, "cheap" particle board floors and walls offer both the advantage of needing minimal maintenance (no future re-painting) and offering a textured warmth to the space. 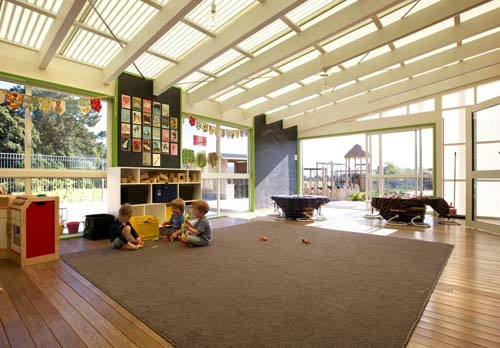 Carpet is used also sparingly and timber slats are used as a feature for the balcony. A minimal use of blue and green (doors, trims and cabinetry) adds a splash of accent colour and fun. Seen above is an "indoor-outdoor" space (enclosed porch) offering play no matter the weather with a feeling of being closer to the outdoors. Below, planter boxes provide the means for children to learn about and grown their own food. And the fitted out kitchen space to prep said food! 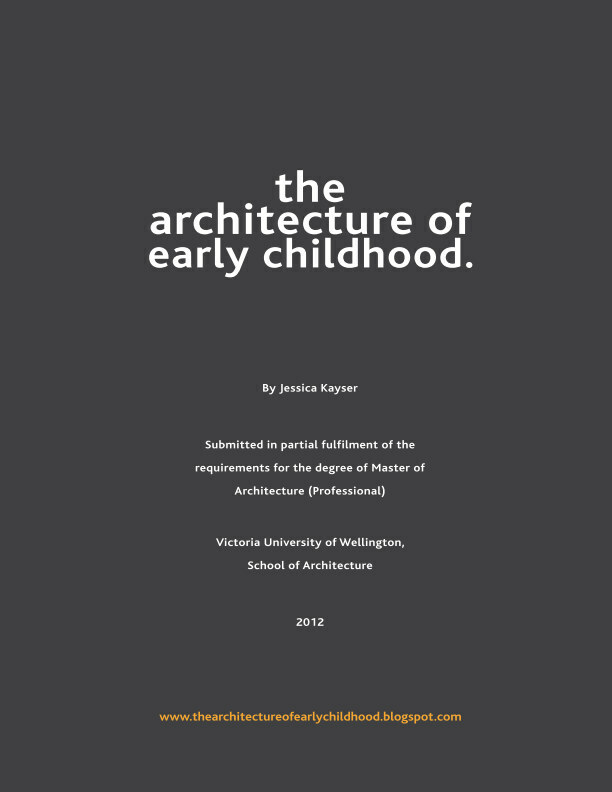 Overall it is a modest yet functional and thoughtful response to providing an architecture for young children. 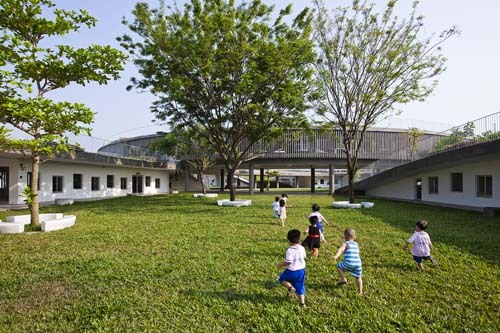 Reminiscent of Tezuka Architects' highly praised Fuji Kindergarten (see post here) is this 'Farming Kindergarten' designed by Vo Trong Architects with its soaring habitable roof. 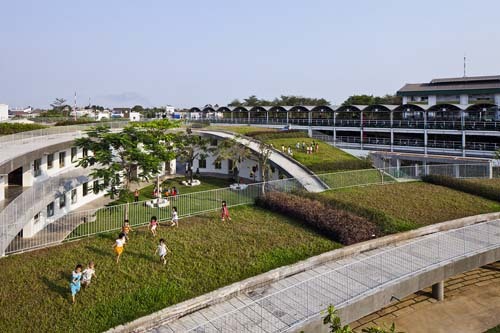 Receiving the Architectural Review "Highly Commended" Award, the kindergarten design is a reaction to Vietnam's rapid urbanization (and subsequent removal from nature) that the population is facing. 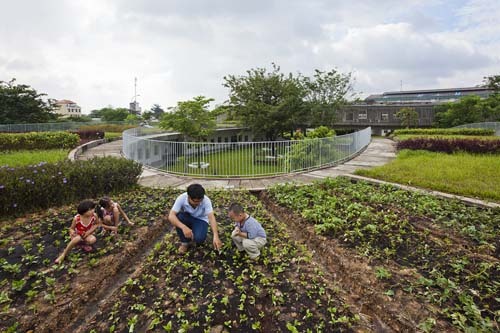 Built next to a shoe factory for the 500 children of the factory employees, it has a continuous green roof that provides expansive space for physical play as well as edible gardens. Teaching children about the work that goes into growing and cultivating ones own food. 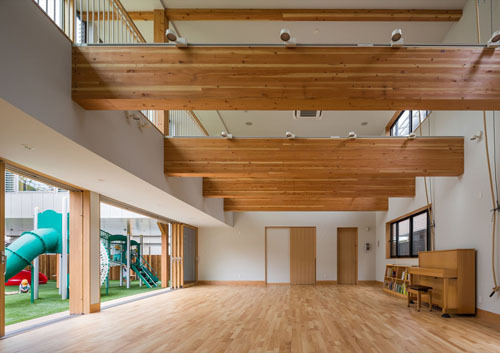 The three loops that the building forms in plan also has the advantage of creating three internal (and protected) play spaces. 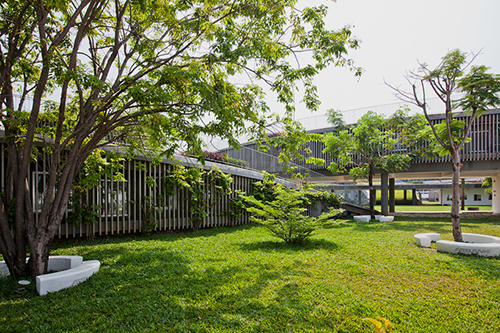 All of which include trees with concrete formed curving bench seats surrounding them so that the children can sit under their shade. The construction is kept simple - with concrete floors, walls and roof and a simple vertical steel balustrade. A budget approach, that yet works. Allowing the natural elements and strong curving form to shine. Along with the ethos of connecting with nature, the architects have included a plenitude of openable windows allowing cross ventilation and lighting. As a result, it can operate without air conditioning, despite the intense tropical climate. 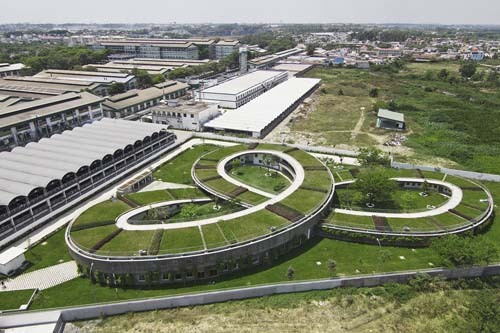 Other strategies of environmental control include using recycled factory wastewater to irrigate the green roof and lavatories and solar power to heat water. 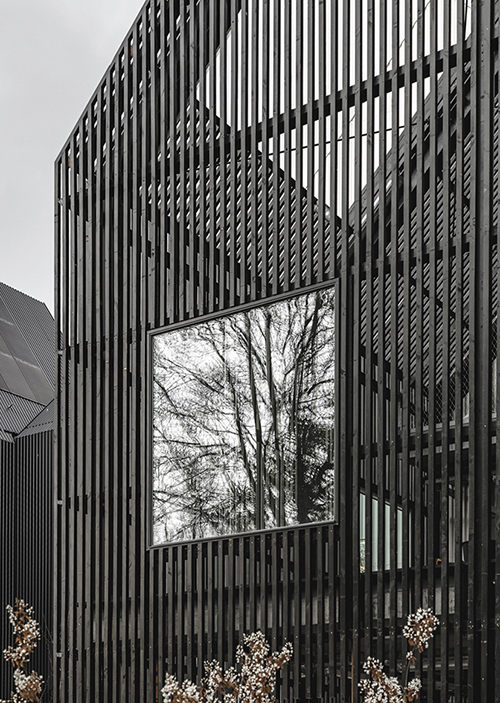 Vertical timber slats on the building's outer facades provides semi-transparent screening whilst also acting as a trellis for creeping plants. Further allowing the building to become one with it's natural surroundings. 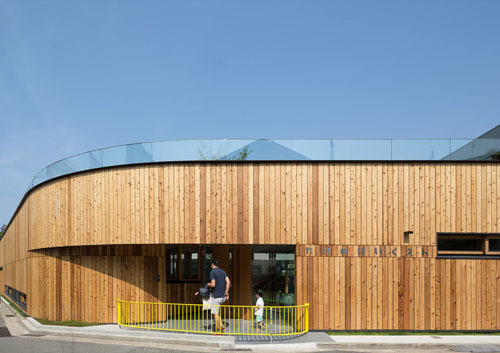 Here is an exemplary example of a rigorous design approach for designing a centre. Unfortunately a lot of the initial ideas seem lost in the final (yet finely articulated architectural) product (as is often the case). 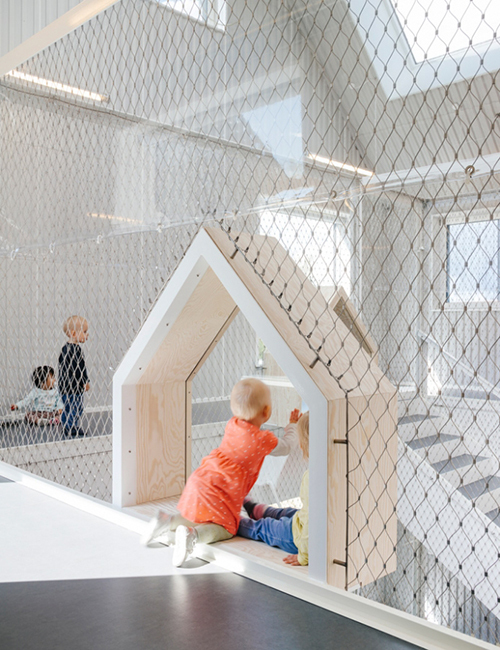 It is a common issue in attempting a way to break down the scale of space to give at once the feeling of homeliness and meet the functional scale of the child. 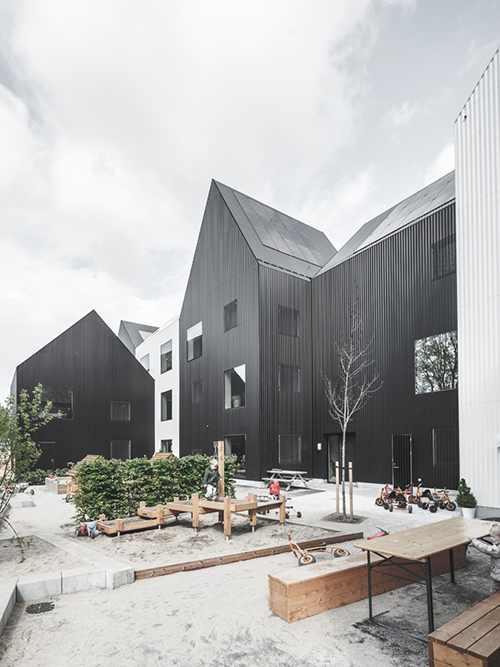 And this was the first thought given by architects COBE who designed this rather large (200 child-capacity) new centre situated in the town of Frederiksberg in Denmark. 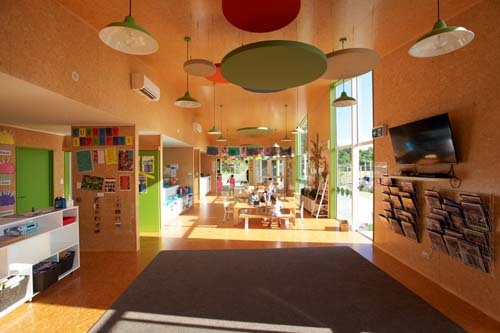 How to make a large kindergarten seem small? The next thought was given over to how to meet the various contextual scales of the surrounding context, to ensure the facility fit within the surrounding buildings and green areas. 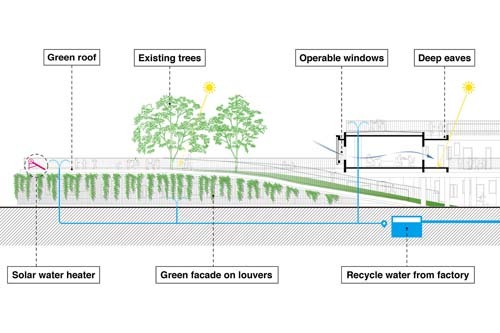 Diagram incorporating the urban, villa and greenery scales of the surrounding context. There are four roof gardens - one of them is a double decker! 11 small houses with even smaller houses inside these houses! The reflective and seemingly random placed frameless windows set in the village-like "houses" are however impressive. 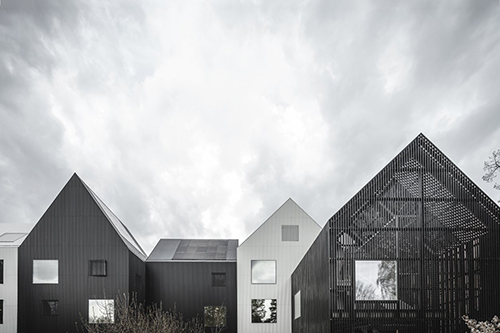 As project architect Eik Bjerregaard explains; The windows were carefully detailed to look frameless ‘like a child might forget to draw the frames’, and the roofline is uncluttered thanks to hidden drainage details, precise material connections, and insetting solar panels flat to the roof surface. 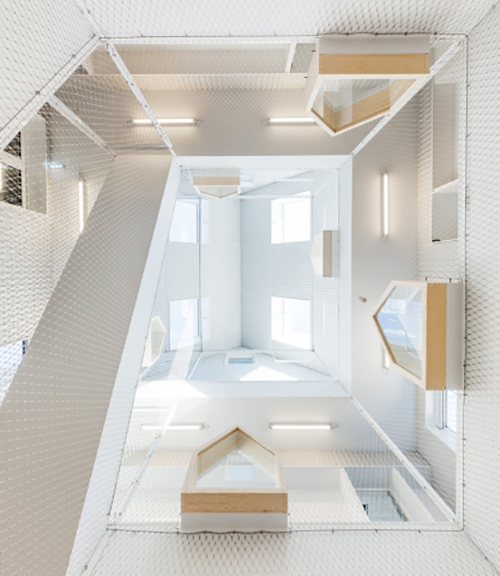 A skylit central atrium with "classrooms" or "group rooms" all facing in through house-shaped window nooks. 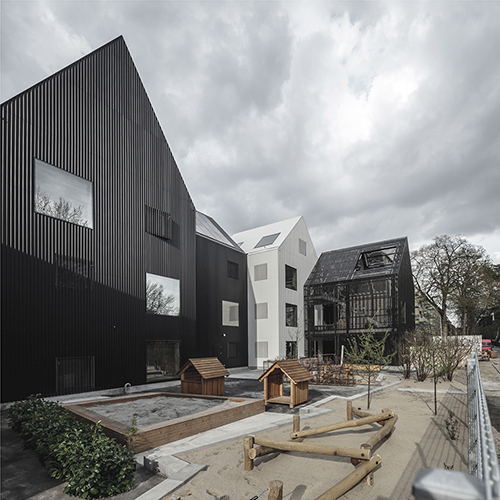 It seems a shame that the initial concepts of warm timbers, natural elements and defining colours were abandoned in the final product which seems to me to be too stark, minimal and cold for "loose" - active and creative children's play. However, the architects must be commended for their design methodology which exhibits a thorough thought process to designing for children. 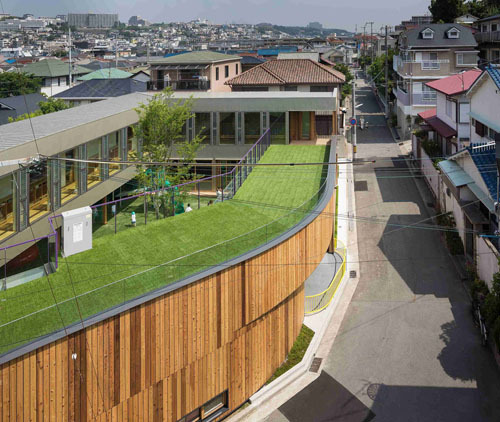 In a built-up area of Kobe, Japanese practice Tadashi Suga Architects have completed the Takeno Nursery School. 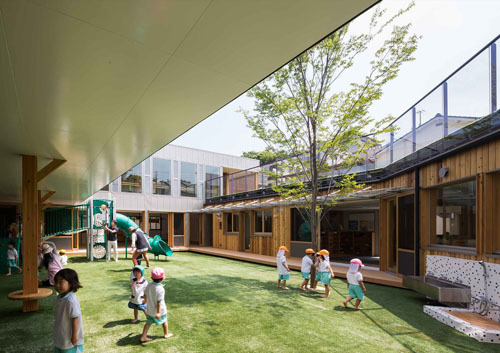 Positioned on a prominent corner plot surrounded by busy roads, the design team positioned the playground at the center of the plan, with the building constructed along the site’s boundaries. At the upper level, a green roof overlooks the internal courtyard. Careful scaling to the street has been paid with the levels not exceeding single storey - thus softening the junction with the neighbouring street. 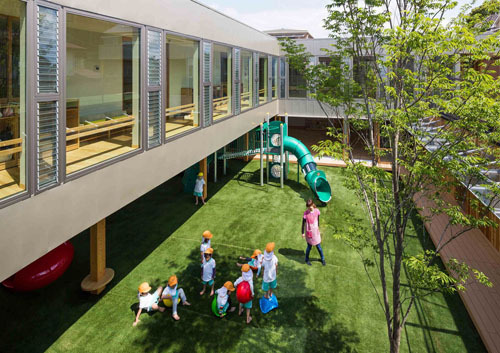 The internal courtyard play area remains open to fresh sunlight and air, yet provides an enveloping enclosure for health and safety. 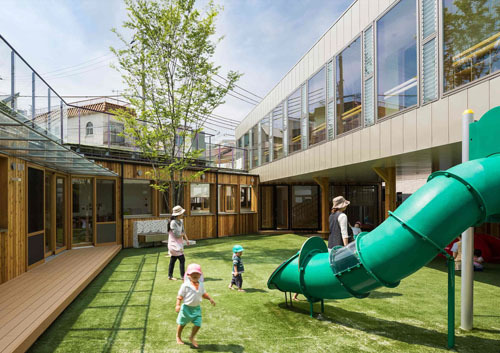 Predominantly natural materials, large sliding doors on the ground level and upper clerestory mechanically controlled windows continue the theme of the courtyard theme and in providing a healthy environment for the young children. Above, the entrance is "cut" into the center's mass and is further marked with a yellow fence and signage appended to the buildings cedar-clad curving exterior. Some parking is provided for on the ground floor with space being maximised with the top storey being cantilevered over "piloti". 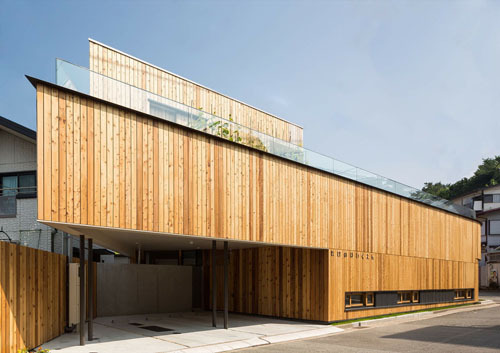 A glass balustrade on the rooftop minimises the frontage of the building to the street. I particularly like the architect's treatment of the structural columns, the stained timber symbolising a trunk with a branch to hold the level above. A rounded edge is provided also at the child's height to minimise risk of injury and also allows the child to sit / stand on or jump off. 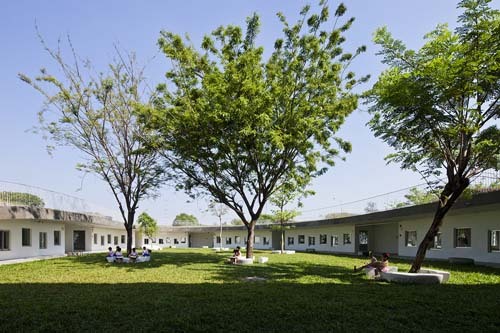 A tree in the centre further grounds the concept of the central outdoor courtyard and its prominence in the kindergarten. A simple purple steel framed, glass panelled railing (combined with the yellow entrance version) adds subtle pops of colour into an otherwise pared back material palette. 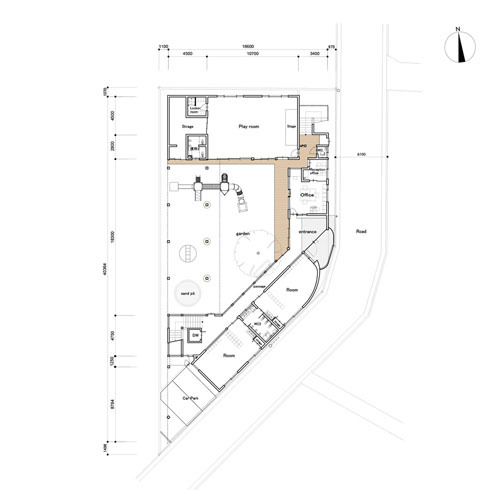 Ground Floor Plan - showing the playground structure, a sand pit, a water play area and garden. 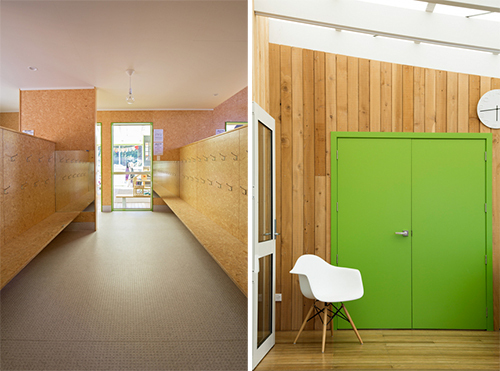 The playroom is double height with a mezzanine level overlooking it from above (see below). 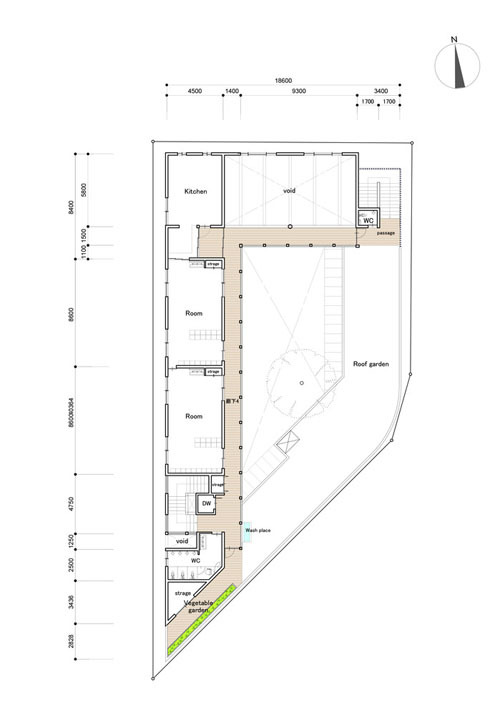 Level 1 Plan - showing the green space, a deck and even a vegetable garden. The Level 1 "L" plan allows a mezzanine type connection to the floor's activities below.